Encouraging students to continue their formal schooling after high school, and helping some see that dropping-out of high school is not the wisest decision they can make, is an on-going task. I recently found another good related resource I can use in this effort, and decided to bring all the materials I use (and that I’ve posted about previously) into one post. It’s a short list, and I hope others can suggest additional resources. I’m sure I’ll be adding to this list in the future, too. 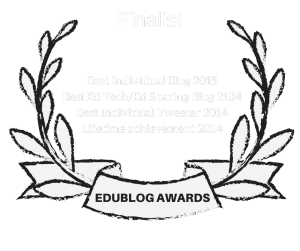 You might also be interested in The Best Sites For Encouraging ELL’s To Attend College. The Future Trends of the Job Market is a new infographic which clearly shows the salary gap between those jobs that require professional degrees and those that do not. Here’s a nice chart that shows the longer you stay in school, the less time you’ll be unemployed. It also shows the difference in monthly incomes by education levels. Average Earnings In Relationship To Educational Attainment is an accessible chart from the U.S. Census Bureau. “High Learning Leads To High-Earning” is a very accessible infographic showing how people’s salaries are related to their educational attainment. GOOD Magazine has come-out with another good infographic — this time showing average starting salaries by educational attainment. “Education vs. Employment” is a nice infographic showing, among other things, the difference in income that may come from different levels of educational attainment. The economic value of a college diploma is nearly twice as high for women from disadvantaged backgrounds as for women from privileged backgrounds, the findings show. For disadvantaged men, the lift is even greater:A college education is worth three times more for them than for privileged college-goers. The report itself is not accessible to ELL’s. However, it would be easy to create a simple summary of its results. 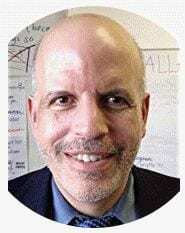 Of course, the key way to help students see its importance is not just by showing them a bunch of statistics, but developing a relationship with them; learning their hopes and dreams for the future; and help them see how in many areas — not just economically — furthering their academic career will help them achieve their goals. These materials are just a few tools that might be helpful. Students whose career goals did not require education (e.g., sports star, movie star) spent less time on homework and got lower grades. The good news is that the researchers found it was easy to make education more salient, and thereby motivate kids. When students were shown a graph depicting the link between education and earnings, they were much more likely to hand in an extra-credit homework assignment the next day than if they were shown a graph depicting the earnings of superstars. Here’s more information about that study. Get Schooled has an accessible graph from the Bureau of Labor Studies showing the latest data on income based on educational attainment. Get Schooled also has a short summary of a study released by the Georgetown University Center for Education and the Workforce that predicts by 2018, 63% of all jobs will require some sort of postsecondary education. It’s not accessible to ELL’s, and nor is the report it’s linked to, but it’s still important information to share. Another Reason To Stay In School — It Lowers Dementia Risk is a post I wrote about a study showing that the more education you receive, the lower you are at risk to suffer symptoms of dementia. How Much is a College Degree Worth? is an infographic that shows various economic advantages of having a college degree. Stay In School & Reduce Your Risk Of Hypertension is another post I wrote about results from a new study. College Grads Expand Lead in Job Security is the title of a Wall Street Journal article about the economic advantages of having a college degree. It would have to be modified to be made accessible to English Language Learners, but it has some good information. Cost of college: Grads break even by age 33 is an article in USA Today. It has a great chart comparing how much a person can expect to earn if they have a high school degree, an associate degree, and a B.A. It’s different from other charts I have seen because it shows the cumulative difference year-after-year. Value of College Degree Is Growing, Study Says is a New York Times article about the same study discussed in USA Today. It doesn’t have the chart, but it does include some nice quotes from the researchers. Unemployment Rate and Level of Education is a good article with updated statistics of the economic value of added schooling. It includes two very accessible graphics. One compares wages and the unemployment rate by educational attainment. The other is a graph that shows the unemployment rate over the past ten years by education level. I’ve written a post providing updated figures from the Census emphasizing the economic value of going to college. 4 Reasons to Earn Your College Degree provides a good interactive chart showing unemployment rate by years of education. Education reduces blood pressure is a BBC article on a new study showing the health impact of continuing your academic career. Two more graphs on college comes from Ezra Klein at The Washington Post. Analysis of 171 college majors puts engineers at the top is from USA Today. College pays — for grads, not taxpayers is a useful summary of a report from the American Institutes For Research. A college education is your best bet is from CNN. Education Pays is an updated chart from The Bureau of Labor Statistics. 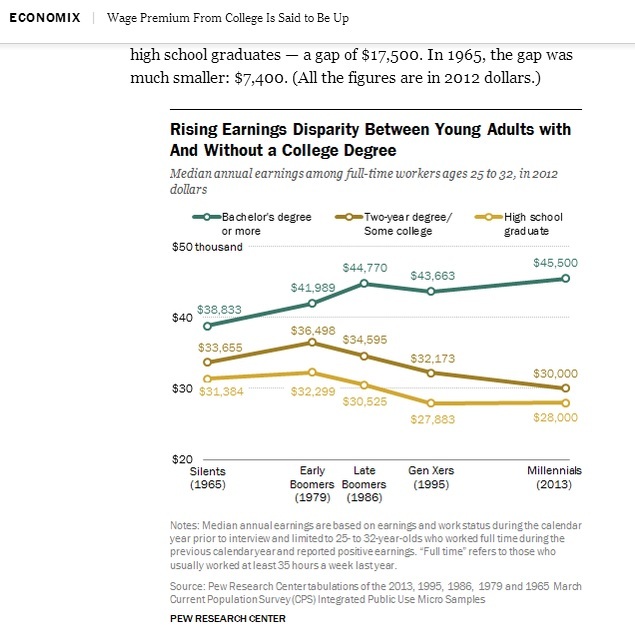 The Value Of College, In 2 Graphs comes from NPR. 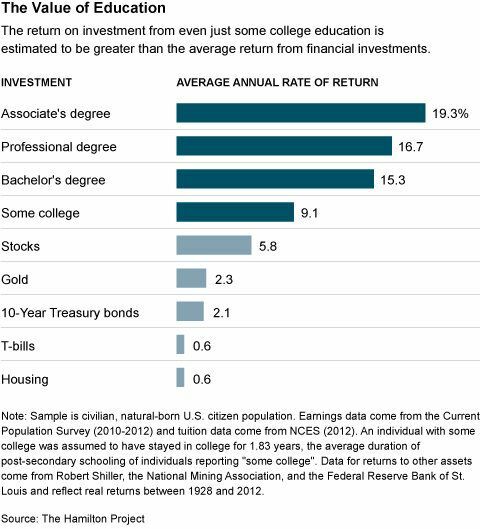 What’s the Best Investment: Stocks, Bonds, Homes … or College? is from The Atlantic, and includes some good charts. Who is falling out of the middle class, in one chart is from The Washington Post, and shows the importance of education to economic security. Education Five Times More Important Than Gender for Income is from The Atlantic. Census: Education Has Greater Effect on Earnings than Race, Gender is from Education Week. New high school grads not in college face extra-steep job barriers in Sacramento region is from The Sacramento Bee. Debt By Degrees is a short New Yorker column that describes the economic advantages of having a college degree. Research Desk: Just How Good Have College Grads Got It? comes from The Washington Post. Education Pays is a good chart showing salary by educational attainment. Tough Time For New College Grads is a graphic from The Sacramento Bee. Despite its title, it does show the importance of pursuing an academic career. Behind the Numbers: Why Dropouts Have it Worse Than Ever Before is from The PBS News Hour. Graduates’ Pay Is Slipping, but Still Outpaces Others is from The New York Times. Unemployment Rate for Demographic Groups is an interactive from The Wall Street Journal. Getting a Degree: Less Rigor, More Value is from The New York Times. Who Shouldn’t Go to College? is from The New York Times. Sweden’s enormous education experiment improved longevity is from Nature. Though Tuition Is Rising, Value of Education Is Rising Too is from The Harvard Business Review. College Degrees and Unemployment is from The Wall Street Journal. More Young Americans Out of High School Are Also Out of Work is from The New York Times. Study: College degrees pay off most for African Americans in California is from The Bay Citizen. Study: For-profit college degrees don’t help grads earn more is from The Washington Post. It includes some important information. The United States Department of Education launched a new website designed to help students plan for their continuing education — StudentAid.Gov. To tell you the truth, the site looks okay, but I’m not convinced it’s that much more helpful than what’s already out there on the Web. However, it did have this great infographic titled Why Go To College? And here’s another version of it. “It’s as if Americans with the least education are living in a time warp,” he said. The least educated black men are living in 1954, black women in 1962, white women in 1964, and white men in 1972. One surprising finding, according to Olshansky, is that white women with less than 12 years of education can expect to live five years less than their counterparts did in 1990 (a decline from age 78 to 73). Don’t believe the haters. 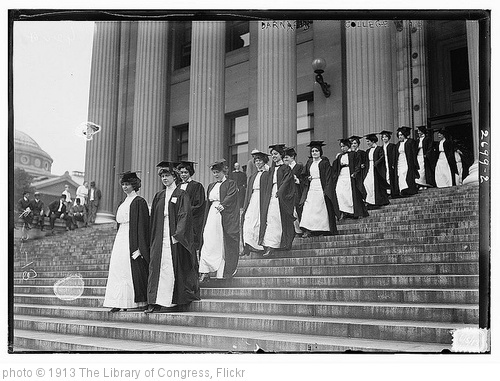 College is a great deal — and it’s getting better. is from The Washington Post. “The employment rate for graduates is down. Of the three categories below, high school graduates fared the worst after the recession. Their rate has fallen by 16 percent” is a graph and article from The New York Times. This is a very large infographic, but it’s it’s worth taking up so much space because it’s so good. For high school grads, the economy keeps getting worse is from The Washington Post. Life Is O.K., if You Went to College is from The New York Times. Job prospects make college loans worthwhile, study says is from The Los Angeles Times. The New York Times has published a report on a new study they title The Premium From a College Degree. Wage Premium From College Is Said to Be Up is from The New York Times. Going To College May Cost You, But So Will Skipping It is from NPR. Infographic: Better Education = Healthier Lives is from The Robert Wood Johnson Foundation. Reynolds and Baird conclude that there are no long-term emotional costs to aiming high and falling short when it comes to educational aspirations. This contradicts decades of research that holds that unmet educational expectations lead to psychological distress. In fact, not trying is the only way to ensure lower levels of education and increased chances of poor mental health. So, go ahead and shoot for that moon. The Value of College: It’s Not Just Correlation is from The New York Times. Is College Worth It? Clearly, New Data Say is also from The New York Times. Chart: College really does pay for most people is from Vox. Is going to college worth the cost? is an interactive from Fusion. How More Education Could Save A Half-Million American Lives is from NPR. It’s a Tough Job Market for the Young Without College Degrees is from The New York Times. College-Educated Workers Now Dominate the Labor Market is from The Wall Street Journal. Importance of College Underscored by Post-Recession Jobs Recovery is from Education Week.